Harvest when flowers are just beginning to open. Member of the Compositae (aster family). Common family relatives include sunflower, aster, zinnia, ageratum, chrysanthemum and lettuce. Stems to nearly 30 inches, leaves basal, lobed. 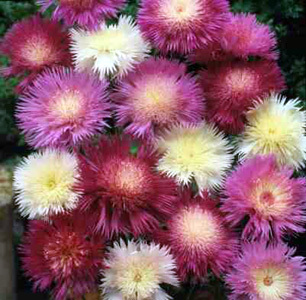 This species is possibly better known as Centaurea moschata, well known and loved in cottage gardens for its sweet fragrant flowers. Flowers are suitable for drying in borax which reportedly preserves the flower color better than air drying. Colors range from pure white (‘The Bride’) to the mixed colors ranging from white through yellows and pinks (‘Imperialis’).